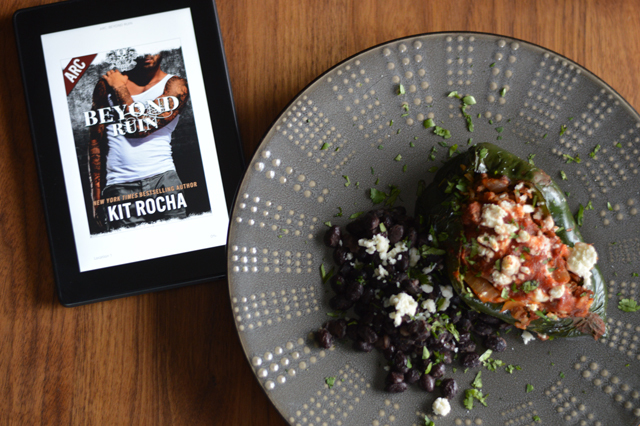 Beyond Ruin is the latest in the long-running dystopian future romance Beyond series by Kit Rocha. These are most definitely not standalone books, but the first one, Beyond Shame, always seems to be free at all the major ebook outlets so it’s a low-risk way to try the series. Of all the books in this dark, gritty and yet also somehow hopeful series, Beyond Ruin has been the most hotly anticipated by me. See, it’s Mad’s story–Adrian Maddox–also known as “the Prince of Sector 1”. From the very beginning I’ve found Mad an irresistibly intriguing character, coming as he does from the charitably-inclined, theocratic Sector 1. So I was incredibly surprised that it wasn’t Mad who captured all my love and affection in Beyond Ruin. When the book begins, Dylan “Doc” Jordan and Mad are a couple. While it’s clear that they don’t view their relationship as whole or even permanent, they provide necessary solace to one another. They also both have fantasies about two of the Sector 4 women, Scarlet and Jade, who are also a couple at the beginning of the book. Scarlet and Jade’s relationship seems to be on a firmer footing, less about filling a need in a moment and more about love and a permanent partnership. But in true Sector 4 style, there’s always room for more affection and Beyond Ruin brings these characters into a complex, but loving foursome. In Beyond Ruin, the political tensions between the Sectors and the powerful governmental center of Eden come to a head. It’s been headed this way for six books, but here is where the cold war conflict develops into full-scale violence. Jade’s original home, Sector 2, is bombed by Eden and the Sector leader and Jade’s former mentor is either killed or missing, leaving a power vacuum. I’m skirting spoiler territory here, but in order to explain what was so compelling about this book versus the previous highly entertaining, filthily delectable previous offerings, I have to talk about Jade. Over the course of the series, we have seen the roles of women evolve from consort and sidekick to highly valued and equal members of Sector 4 society to taking real political power on the larger stage. Jade’s journey in this book is instrumental to the overall thematic development of the series. Her struggles with identity, what it means to be a woman in power and how to balance that with loving and being loved spoke to me at a level romance really only reaches at its best. If you’ve been by-passing this series, please reconsider. The first few books were delightfully dirty with just enough intriguing world-building to keep me engaged. This latest installment is actually brilliant. The way the foursome between Jade, Doc, Scarlet and Mad develops is fascinating, unlike anything else I’ve ever read in a ménage context. And the continuing political turmoil in the Sectors and Eden takes a dramatic turn. Beyond Ruin is a work of startling subtlety in a series that started out as bawdy fun and I can’t wait to see what Rocha comes up with for the last two books. From what I’ve been able to gather, the Sectors and Eden are physically located somewhere in the American West. Perhaps, like, Las Vegas? I mean, there’s nothing in the books that really says that, but I’ve always assumed the books took place somewhere close to Los Angeles. But with a lack of political divisions comes a lack of character awareness of our cultural distinctions. For example, Mad’s family seems to be of Mexican descent though I don’t believe it’s ever explicitly stated. The talk of saints and the iconography is reminiscent of Catholicism, though that’s not exactly the religion Sector 1 seems to practice. 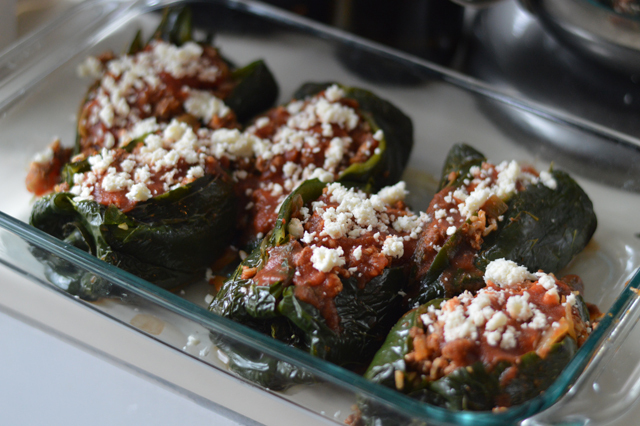 Anyway, when it came time to pick a recipe for this book, I decided to go with the stuffed poblano peppers Mad’s family serves when he and the other main characters visit them in Sector 1. It’s a pretty significant scene, coming as it does at the onset of hostilities between Eden and the Sector leaders. Plus, I just love chorizo. Speaking of which, this recipe calls for some ingredients fairly specific to Mexican cuisine. 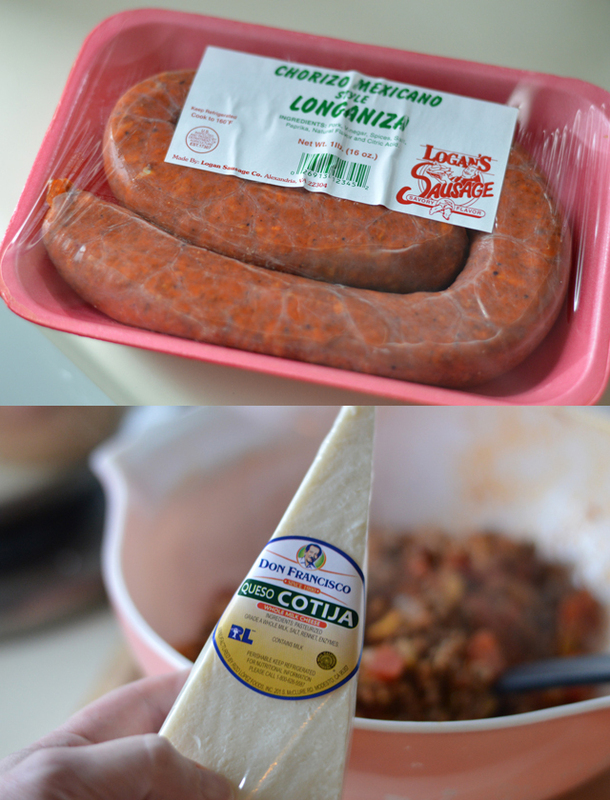 Ideally you’ll be able to find chorizo and cotija cheese. If you have to substitute though, I’d actually recommend Hungarian sausage over any other type, or hot Italian sausage if you really have to. Chorizo is pretty heavy on the paprika so if you’re using Italian, maybe throw a teaspoon of sweet paprika in too. And cotija isn’t really like anything else either. But again, if you have to substitute, a crumbled feta cheese probably comes closest in taste and texture. Otherwise it’s a pretty simple recipe. 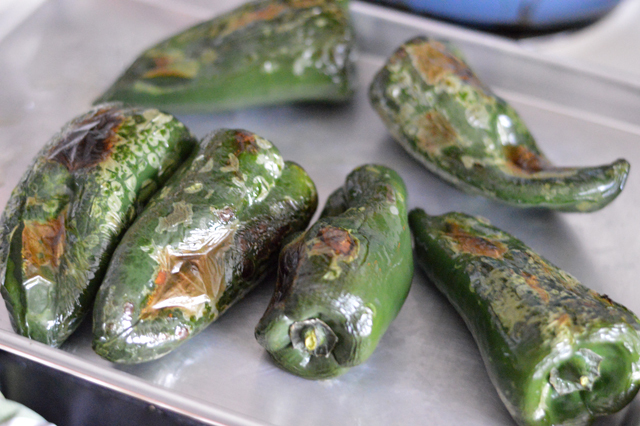 I prefer to slit poblano peppers open lengthwise and carefully remove the ribs and seeds, but that can be a little tricky. If you have trouble, you can cut them fully in half and spoon the mixture into them. The flavor won’t suffer. I just don’t think they’re quite as pretty without their tops. Disclosure: I am friendly with Bree Bridges, one half of the Kit Rocha team, and received an eARC from the author for review purposes. Preheat the broiler and put one rack in the top third of the oven. Toss the peppers in olive oil. Place on a cookie sheet cover with foil and broil until blistered all over, turning every 2 minutes, about 8 minutes total. Remove from the oven and place in a large bowl covered with plastic wrap. In a large skillet, brown the ground beef and chorizo with the oregano, cumin & coriander, about 5 minutes. Remove the mixture from the pan with a slotted spoon. Add 1 teaspoon olive oil. Add the onion and cook until translucent, about 5 minutes. Add the garlic and cook for an additional 30 seconds. Add the tomatoes and scrape up any browned bits on the bottom of the pan. Return the meat mixture to the pan with the tomato paste, rice, cilantro and cotija. Peel the pepper, slice them open carefully length-wise and remove the ribs and seeds. 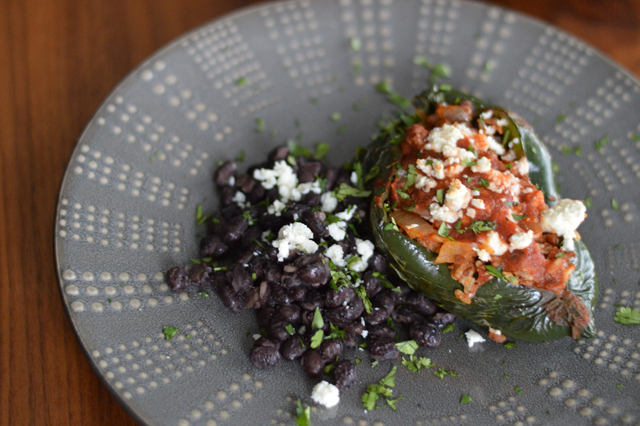 Place the peppers in a 9″ by 13″ baking dish. Fill each of the peppers with meat mixture and set aside. Add all ingredients to a small saucepan, bring to a boil and let simmer for 5 minutes. 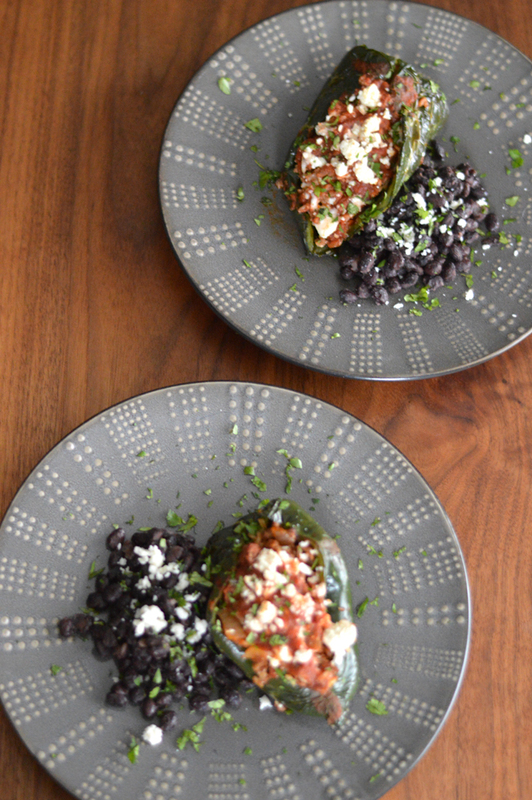 Pour about a tablespoon of sauce over each pepper and sprinkle with remaining cotija cheese. Sprinkle with additional cilantro if desired and serve with black beans.